How much fun can you have for a fiver? Living on a budget can mean having to avoid expensive forms of entertainment but it doesn’t mean you can’t have fun. As part of our series of challenges to the MoneyAware team, this month we’ve investigated how much fun you can have for a fiver. Our first ideas of how to spend five pounds involved either cheap alcohol or were a bit dodgy but once we set our minds to it we came up with some good ideas. You’d be surprised how far you can stretch five quid while trying to have a good time. When I decided to take on a film night for this task, I was secretly thinking about the snacks that’d be involved rather than the actual film watching itself. I wasn’t overly fussy about what film I got, so I headed to a second-hand video game/DVD shop to see what was on offer. As I glanced through the shelves, something stood out. Had my eyes deceived me? No, Groundhog Day was on sale for a measly £1.50. I snapped up this classic and headed to a supermarket to pick up some tasty treats. I had £3.50 left, so I grabbed some hot chocolate sachets, marshmallows, squirty cream and mini packets of sweets. The squirty cream was a bit of a luxury splurge at one pound a can, but I thought future hot chocolates would benefit from the buy and as a result, my future self would be happy with this decision. Pleased with my choices I headed home to let the sugar coma and film extravaganza commence. 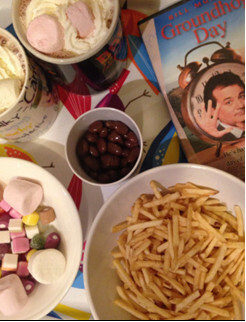 There’s not much to say about the film night itself, we watched the film and ate sweets, as expected. Bill Murray kept waking up on the same day and eventually(spoiler alert!) wins Andie MacDowell’s heart. All in all, it was a good way to spend a Saturday night so this is something I’d definitely do again. I had no idea you could pick up films so cheaply either, so that’s a plus. Next time, I’ll probably skip some of the sweet treats for the sake of my teeth. Let’s be honest, going to the gym isn’t my idea of a good time. Usually I exercise so I can eat more rather than because I enjoy it. But I saw a local gym was offering a day-long trial for a fiver, so I thought I’d give it a go in the name of this blogpost. I paid my fiver and into the gym I went, lycra-clad and armed with my water bottle. The five pound fee included access to all their classes for the day, so after a quick induction I went down to the ‘studio’ where I was told they would be running a ‘pump’ class. I thought the ‘pump’ class sounded like it could be quite energetic and fun, but it turned out it includes weight lifting and squats. Not fun. I was also dealt a side helping of public humiliation when I looked over and saw that the pensioner at the back was deadlifting three times the weight my feeble arms could manage. I understand that older people can be just as fit as anyone else, but it was truly humbling to see them effortless lifting so much more than I could manage. I didn’t let this put me off! Hoping my legs would be a bit stronger than my arms, I tried the spinning class. I like getting out and about on my bike, so I thought this would be a breeze. Again, I was wrong. Spinning is nothing like cycling. In the spin class, around 20 fitness bikes were arranged in a semi-circle facing the instructor who barked instructions at us over loud music for 45 minutes. As you cycle you’ve got to keep an eye on your RPM (basically how many times your wheels are turning each minute), which is all a bit technical. 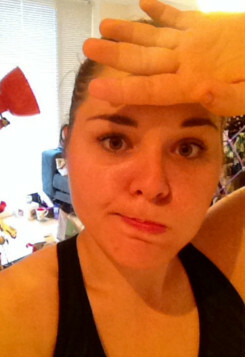 By the end of the class I’d cycled about 18km without actually going anywhere and nearly fell over as I got off. I left the gym looking like a sweaty beetroot and was a bit hobbly for a few days afterwards, but I felt pretty good for having gone. I’m not convinced that exercising is fun but the ice cream afterwards was, so I reckon I’ll be going back! 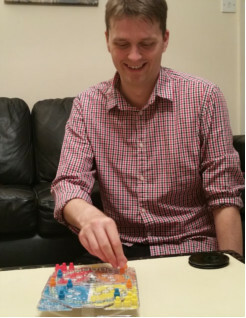 Frustration-style game – This is the classic game where you push down a dice trapped in a little perspex container attached to the board and try to get your pieces around a board. My wife cruelly jumped on top of many of my pieces, which sent them back to the start. This may sound like sour grapes, because my wife beat me, but this game doesn’t really require a great deal of skill. It’s a game that suits people with animal cunning rather than skill. It was fun for a while but I got a bit bored when I wasn’t winning. Cost: Three pounds from a high street discount shop. Biting fish game – This game looks cheap and tacky but is actually quite fun. You wind it up and the little mechanical fish open and close their mouths. Each player has a tiny fishing rod which you use to pull out the biting fishies. I don’t know if it was poor design or a devilishly tricky game but it was really hard to successfully extract a fish from the game and drop it into the little container for caught fish. This made it all the more satisfying when I ultimately triumphed over my wife. She grumbled about her fishing rod not working but I suspect it was my skill the won out! Cost: One pound from the pound shop near our office. Cards – If you’ve got a deck of cards then you’ve got access to an almost endless list of games you can play. There’s a great list of fun card games from the American Grandparents Association – which sounds like a made up thing but it’s a real organisation! We played Texas Hold-Em for matchsticks. If we played for money the night could have cost me far more than five quid, so we played that the loser would wash up for the next week. Perhaps it was the high stakes, but I blew it on a pair of sevens which my wife beat with a flush. I often think about those pesky diamonds when I’m scrubbing the pans! Cost: One pound for a double pack of cards in a pound shop (plus having to do the washing up for a week). Games night verdict: My wife and I had loads of fun. It was a nice change and we were still friends at the end of the evening. Having played Monopoly games that have ended in arguments and bad feeling it’s safe to say our evening was a success. I definitely feel that I picked best for this particular challenge. Turns out it’s pretty easy to do a pamper night for a fiver, maybe even less if you’re super savvy about it! Hair: Coconut oil is marvellous and has a multitude of uses. My hair was looking a bit tumbleweed-like, so I decided to treat myself to a 60-minute coconut oil hair mask by following this guide from The Crunchy Moose. Cost: One pound and twenty nine pence from a high street health and beauty chain (you can also pick coconut oil up in most supermarkets). Face: My face was looking a bit dry and haggard. What else to do other than smear green goop across my gob? There’s two ways you can rejuvenate your face for cheap. you can either make a nourishing face mask out of avocado and honey (I’ve tried this in the past and it really does leave your face feeling silky smooth). This option will cost nothing if you’ve already got the avocado and honey in supply, and it’s a great usage of avocados that are about to go iffy. 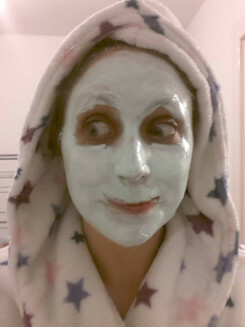 You can do what I did on this occasion and pick up a dead sea mud mask from your friendly neighbourhood pound shop or supermarket for – you guessed it – a quid! Feet: Now I don’t know about you, but I’ve put my poor old feet through some right ordeals over the years. While in the pound shop, I found a 20-minute macadamia foot pack treatment that made my tired old trotters feel and smell GLORIOUS. Cost: One pound from the pound shop. Personality: Nope. No revitalising this glaring flaw, sorry! Have you got five pounds you can fritter away purely on your own enjoyment? If you have then feel free to give our ideas a go or think up your own ways to enjoy yourself for less. If you do then please let us know how you got on in the comments. Check out the other MoneyAware challenges, which include cooking with cheap cuts of meat, road-testing budgeting apps and DIY Christmas presents. My debt management company’s closed down – what can I do? To debt consolidate or not to debt consolidate?